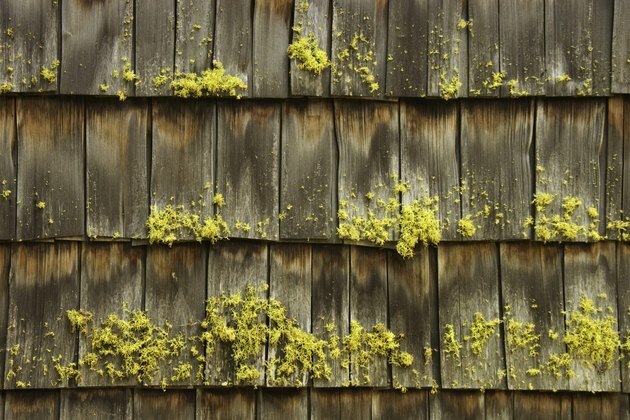 Removing unsightly moss from your roof is an important part of home maintenance. Moss is more than just ugly — it can dam and divert water runoff, causing water to leak into your home. However, while mixing and spraying a zinc sulfate solution, you must be careful to protect the surrounding vegetation and watershed. Zinc sulfate is toxic to fish and other invertebrates. Wood shingles are a favorite place for moss to grow. Put on safety gear, including work gloves, a breathing mask and safety glasses. Pour 3 gallons of warm water in a plastic 5-gallon bucket. Do not use metal — the zinc may react with metal items. Add 1-1/2 lbs. of zinc sulfate powder slowly to the water to avoid dispersing the powder in the air. Stir it with a disposable painter's stick to mix it thoroughly. Pour the zinc sulfate solution into a garden sprayer. Attach a garden hose to the sprayer and apply it to the roof.